Here at RT Fitness we make things simple. There’s nothing complicated about how we do things and that’s because getting in shape doesn’t need to be complicated. The application might require some discipline or motivation but the theory is simple. I mean seriously, a child could do it. Due to this simplicity we remove most of the usual excuses people use to stop training. There’s no waggon to fall off, there’s no restrictions to give in to. The only damn reason there is for not listening or for giving up is because A. you want to or B. you have to. 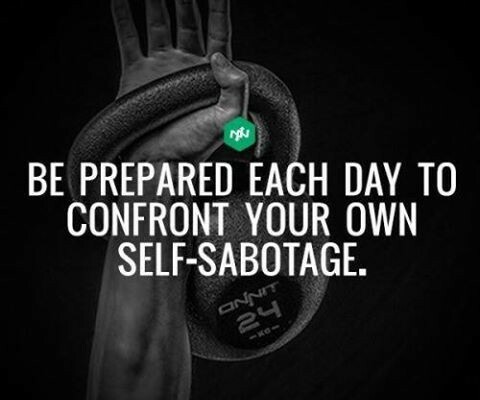 This got me thinking… do people deliberately self sabotage. Do people look for a reason to fail or quit before they even start something and if this is the case is this damaging behaviour a conscious or sub-conscious thing. I’m going to be honest before you read any further I still don’t know the answer to the above question. What I do know however is this; the more barriers and reasons to fail we remove, the more elaborate people’s reasons for giving up or not getting results become. I mean if the option to say “I couldn’t stick to the diet” doesn’t exist then what’s the next port of call… the programs work that’s undeniable. Looking for something to blame becomes difficult and that makes it all the more obvious what the real goal is. It’s a strange one you see, because in order to have joined a gym in the first place and paid your money then a want to change yourself must exist; the desire has to be there or you wouldn’t have bothered coming at all. However, to then actively look for a reason to fail so you can stop and then look back and say you tried it and look what happened. You failed again for…… Reason. Suggests a much more deep routed problem. This is a behaviourism that repeats itself in many avenues but it’s most applicable to the average person when discussed from a diet and exercise perspective. After some serious thought and many conversations with my fellow coaches here at RT HQ lead me to the following hypothesis. People think it’s black and white, you either want to get in shape or you don’t. I disagree and I believe these blurred lines are why the above phenomenon exists. There’s a group of people in the middle who don’t actually want to change in reality, they like their life and they’re happy the way they are. The modern laws of life according to social media lead us to believe that constant self improvement must be achieved in order to keep up with ever elevating levels of society. Obviously we all know that this adult illusion of life as created by Instagram is essentially adult make believe. It’s that plastic crown you put on when you were 3 years old that for the hour you had it on made you believe you were an actual princess. The principle is the same. No matter who you are or how mundane your life may actually be you can take pictures, write statuses and filter away until your life appears as perfect as it isn’t. So when society expects, despite having no real desire to lose weight or get fitter, people feel the need to at least appear as if they are trying. What it comes down to is in the eye of the ever watching public that it looks better to try and fail for “X” reason, than it does to not bother doing anything. Which in short was what you wanted to do from the beginning. Nothing. The beauty of this is it never has to end. Ever heard of….. Who’s tried every diet going and every gym and every class. Yeah exactly. I still don’t know if this is done consciously or sub-consciously but I guess the message is… before you do start anything think long and hard as to whether you actually want to do it. What are your reasons for doing it. Do you want to or do you feel you’re obliged to try because the answer to that question will ultimately determine the results that you get.